Just like one of the magicians in his animated features, director Hayao Miyazaki plucked the spirit for the leading character in his breakthrough feature from that of the daughter of an old friend. The ten year old was displaying all the usual signs of unrest and sullenness that beset many kids in the modern age and Miyazaki wanted to offer her an alternative reality, something that would inspire her and challenge her to snap out of it. Like the real girl, the animated Chihiro (whose name means “a thousand fathoms”) starts out depressed and surly but soon changes her tune when she is whisked out of her surroundings into a parallel universe dominated by an amazing bath-house where spirits come to replenish themselves. Being human, Chihiro has a dangerously different aroma which offends the noses of all who work there; all except Haku, a young boy who has been enslaved by the greedy mistress of the establishment, Yubaba. Haku instructs Chihiro to demand a job from the ghastly woman who, having made a vow never to refuse anyone work, is forced to sign her up. But as soon as her signature is on the contract Yubaba snaffles half of it, leaving Chihiro with the name of Sen (‘a thousand’). In order to reclaim her identity our heroine must undergo a series of trials, the first of which is to clean the biggest, grottiest tub in the house. No sooner has she set to work than she is burdened with the most putrid of guests; a stink spirit. Staff scramble to get out of it’s way as it lurches past, leaking vile, deep purple gloop. If the scope of Miyazaki’s imagination hasn’t revealed itself by now, then this is when it really lets loose. Without spoiling the fun, suffice to say that Sen/Chihiro is well on her way to reclaiming her name and that of Haku in the process. 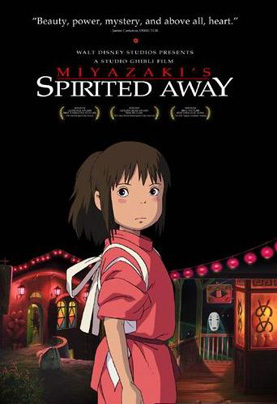 Miyazaki hit pay dirt with this, his seventh film for the famous Tokyo based Studio Ghibli, taking out the Oscar for Best Animated Feature of 2001. His much anticipated follow up feature, Howl’s Moving Castle, which was based on a book by British author Diana Wynne Jones, will be released here soon. It has a more western sentiment than Spirited Away which, with its uplifting message of love and courage wrapped up in delicious candy colours, can’t help but win you over.